I'm digging the fancy condominiums at the top. Squawking birds was always one of my classic "sounds of mall." Seems kinda cruel these days, but it was a lot of fun as a kid. And yet another Kinney Shoes store. There sure seems to have been a lot of them. That shop on the left looks intriguing though. I don't like the color of the cage, but the fact that it's a giant birdcage in the middle of the mall cancels that out and makes it cool. ....couldn't do that now because of a million public health hazards!! Jus think of all those "bird flu" scares that would incite. We've really evolved into a bunch of "scardy cats" haven't we? Bird flu wouldn't be a problem for birds in enclosed cages inside malls, because without contact to wild birds they would have no way of catching it. Though I can see people complaining that their kid suffered an asthma attack, because it's allergic to bird dung or something. Kinney (owned then by F.W. Woolworth Co.), as well as rival chain Thom McAn (then under the Melville umbrella of various mall names, including Chess King and Kay-Bee Toys), were very prominent through the late 1980s before 'lower quality' chains like Payless became the norm. Couldn't go to a mall without seeing one or the other, or both. I'm not sure when they ditched the whole idea of having birdcages in enclosed malls, but it had to of been before my time. None of the malls I ever visited in my neck of the woods in the early 1980s had them. 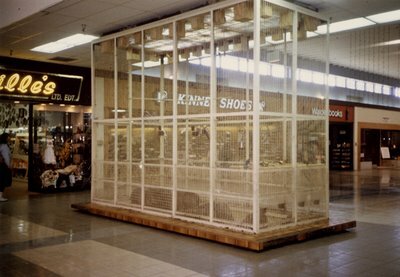 I still think this is the ugliest mall birdcage I've ever seen a photo of. I thought they were all supposed to be elegant like the Cherry Hill ones! The birdcage was there at least until late 80s or early 90s. I remember it as a very young kid (maybe 3 or 4) and wasn't born until 1985. I also have a faint recollection of one of the birds escaping somehow when workers were attending to the cage, and seeing them try to corner the thing in one of the corridors. Wow, that photo brings back memories. I spend hours hanging out by the bird cage and the Walden books in the mall. That was pre-Ross Park days.